Out of the box, Asterisk based systems have most, if not all, of the functionality that you need in a PBX or call center system. However, there are some features that people consider to be “not up to par”, don’t fit their needs, or features that just simply don’t exist that a particular company simply must have. Here are some software packages you probably didn’t know were out there for Asterisk-based systems. In this article, we’ll discuss these Add-ons by category. 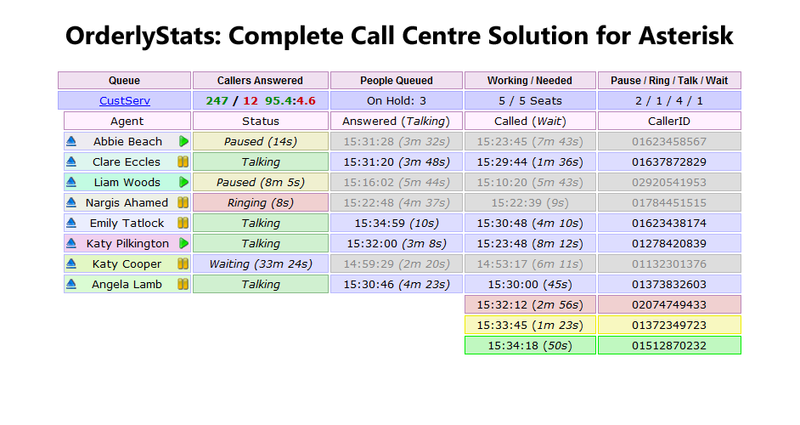 An Operator Panel is any software that can be used by a phone operator or receptionist (or even every user on the system) to manage calls. It typically shows all the phones on the system, whether they are on the phone, who they might be talking to, and allows call transfer and hold operations. This software typically takes the place of a “button module” attached to a phone that would perform the same activities. 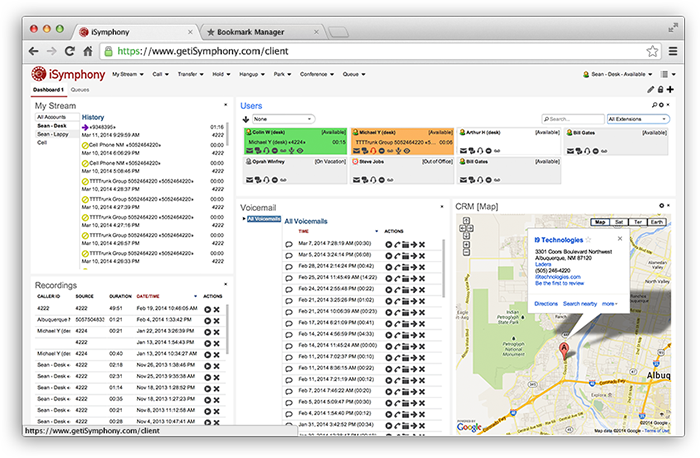 Another very popular browser-based operator panel is iSymphony. It has similar features to FOP2 (including a few extra) and has a free version as well (only allows one login and shows no queues), but has quite a few more features and a bit more “polished” look to it. The commercial version is much more scalable but still cost effective. Because Asterisk can handle call traffic so well, there is a whole category of add-ons specifically designed for managing calls in a call center environment. Typically the packages include call reporting, call flow management, agent management, agent login/logout interface, and a “live wallboard” to see call center performance in real time. In some cases, they are primarily reporting-only tools, but still add a lot of value and insight into the operation of an Asterisk-based call center. Here are some of the most popular call center add-ons. 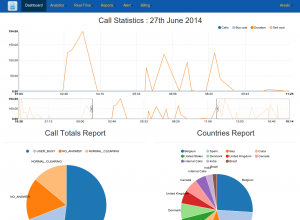 Vicidial is the most often used and most popular call center software for Asterisk. While it is a whole set of scripts and web pages (and really a product all its own), it is still at it’s core, an add-on for Asterisk. We do specialized work in ViciDIAL as well as other software packages, but since it is so popular, we get a large amount of requests for support and integration work, as well as dedicate several articles to it on our website. 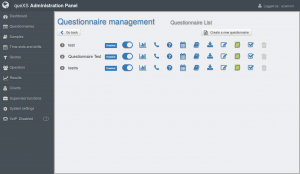 QueueMetrics is a unique software in that it can be used not only for simple queue reporting, but also as a call center queue management system for inbound (and to a lesser degree outbound) call management. 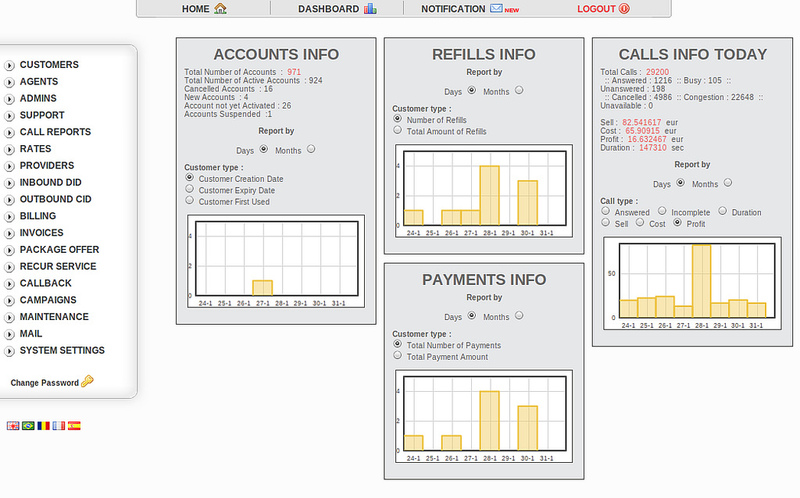 It can be configured to see agent realtime data, connect to a CRM, collect IVR response data, and many other statistical information a standard reporting package does not gather. While the other products in this category are specific to running an entire call center, this software is specific to operating and managing a specific type of call center. 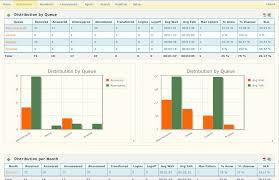 Specifically, it is designed to manage survey campaigns. 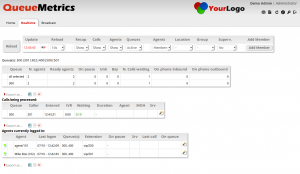 The entire system is set up to allow agents to call prospects, execute a survey of some sort, and gather the results. 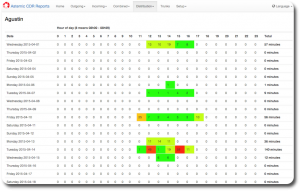 Managers can then run reports on the results as well as specific agent performance. 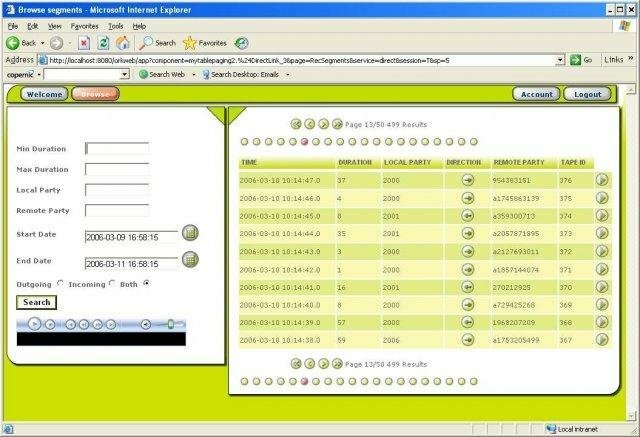 Call Center Stats is another software package developed by the same people who developed FOP2 and CDR Stats (discussed later in this article). 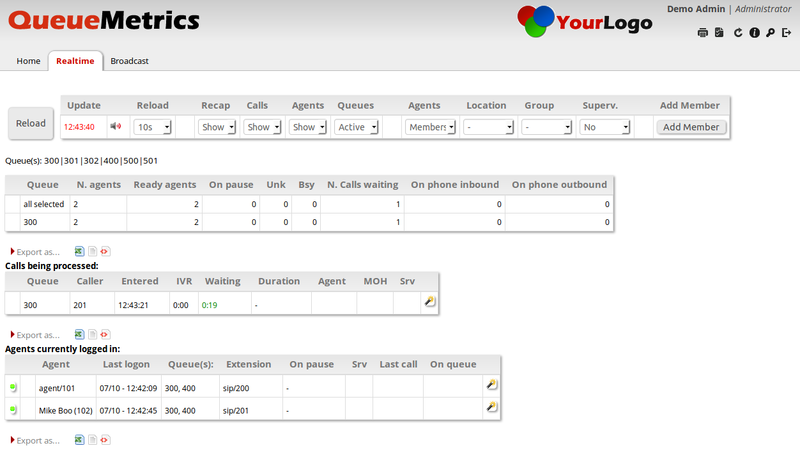 It is comprehensive in showing the inbound queue statistics for inbound and outbound calling for agents. 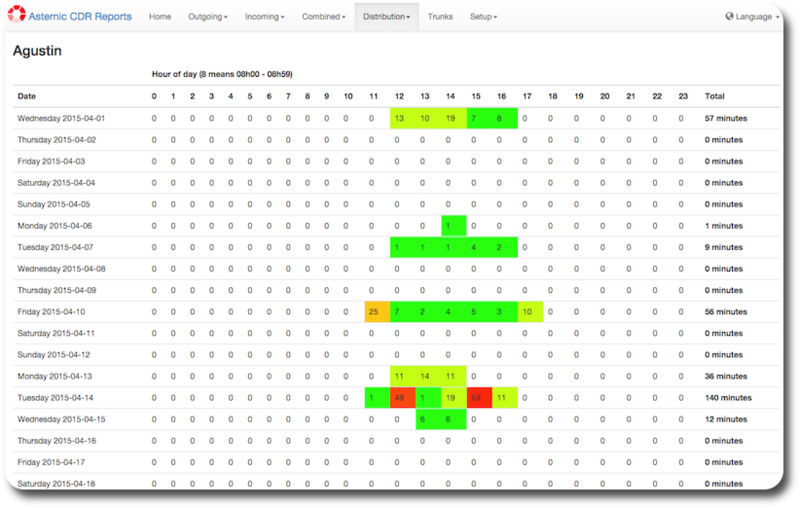 Statistics such as drop rate, number of calls, service level, hourly performance, etc are all available in a nice graphical format. There are both free and paid versions available. 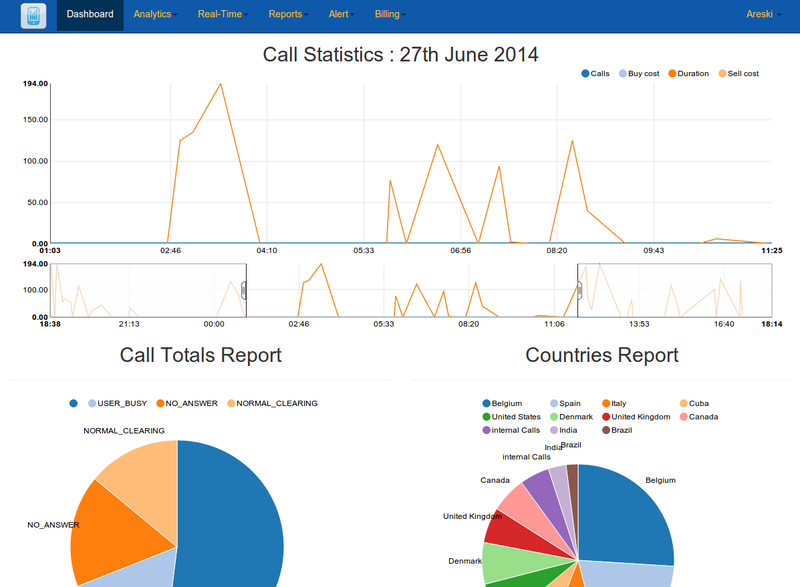 OrderlyStats is another call center performance tool (very similar to “Call Center Stats” by Asternic) that provides all performance data, as well as live statistics about the operation of a call center. It will provide the inbound performance metrics by queue, by agent, as well as a “live” wallboard that can be put on a TV display in the call center to show “at-a-glance” call center activity. Operator panels, in general, are used to control what happens within an Asterisk PBX. Products in this category, however, are designed primarily to display what is actually happening with ALL the functions of the PBX. For example, who is on the phone, what channels are in use, processor utilization, and so on. Let’s take a quick look at two of the more popular. 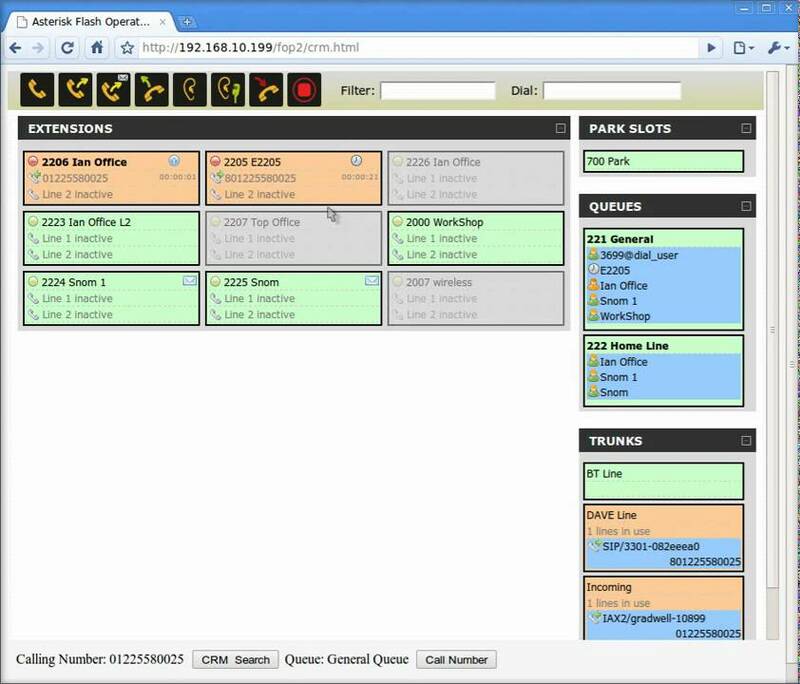 MonAST is a web-based software package that can be installed right on your PBX that will give you a tab-based view of all the functions of your PBX in a “live” view. Additionally it gives you a command line interface (CLI) that you can use to do limited control commands directly with Asterisk. 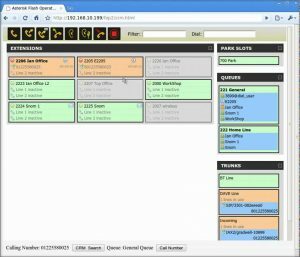 AstChannelsLive is a Windows-based program that will show you primarily a LIVE version of all channels in use (SIP, Analog, PRI, etc). In addition, the latest version will show you a wallboard of queue activity. It provides basic functionality, but is pretty powerful at the same time. There is also a mobile version of the product. Of major interest to owners of phone systems is the integration of their phones to other software, typically Customer Relationship Management (CRM) programs that track their customer interactions. There is a great deal of software that readily facilitates these types of integrations as well as other more advanced integrations. Zoho is a leading web-based Customer Relationship Management (CRM) software. It allows businesses to track customers and every contact that is made between the business and the customers, including emails and phone calls. 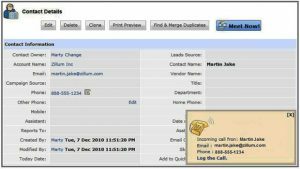 Zoho Phonebridge is a plugin for Zoho that allows an Asterisk-based PBX to speak to the CRM and display customer information on the screen when a phone call comes in, as well as allow “click-do-dial” functions for Zoho and call logging of each call. Activa is a very important component for Windows software users. It is a TAPI driver for Asterisk. 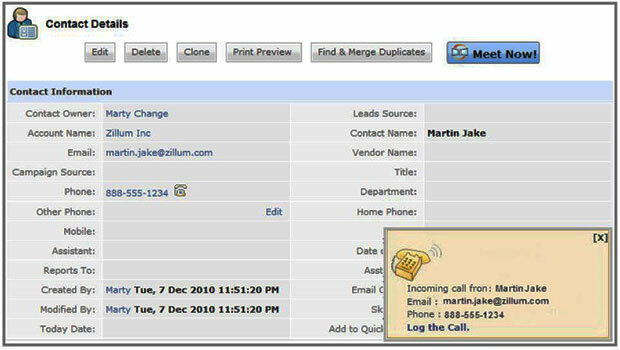 That means you can initiate phone calls through the TAPI software interface on your computer (various Windows CRM software programs use this – like Outlook) as well as do “screen pops” based on inbound calls. The last category of add-ons are those that expand existing functions of Asterisk, but add more capabilities outside of those that already exist. By default, Asterisk has the ability to do Text-to-Speech (TTS). That is, convert any text in the dialplan into machine-spoken (or in some cases-prerecorded female sound file) language. However, out of the box, the reverse cannot be done. Asterisk does not have the capability, without additional help, to recognize the spoken word and recognize it (e.g. Answering “Yes” or “No” to an IVR prompt or saying the name of the person they want to transfer to). There are two primary speech recognition engines that are often use – “Speech Recognition for Asterisk (SRA)” and “Mojolingo RubySpeach”. Each has their benefits and downsides. SRA uses the Google speech recognition engine and Mojolingo RubySpeak API has a company doing technical support for it. A2Billing is a unique add-on for Asterisk that turns it Asterisk into a hosted VoIP billing solution. Essentially, you could put an A2Billing server in place and re-selling SIP dial tone to other Asterisk servers and maintain separate clients, billing plans, etc. There are even calling card functions that allow you to make pre-paid calling cards and bill for them. In large call centers there is often a need to record not just a few calls but hundreds (possibly thousands) of calls. For this it is often necessary to have a separate call recording appliance for this purpose. There is a popular open-source software that does just this, and it is called Oreka. It sits right in the stream of all calls and records the stream of audio data to a file and makes a searchable database of call recordings. In Asterisk versions with a web-based GUI (FreePBX, Elastix, etc), they often include a basic Call Detail Reporting (CDR) search function. 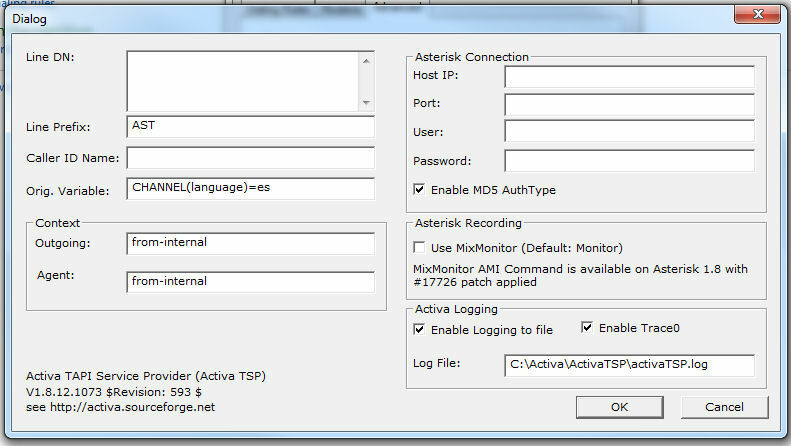 Unfortunately because of how Asterisk records call records, and the simplistic nature of the GUI’s, it is often difficult to obtain truly useful data from these CDR tools. Asternic has developed a plugin for FreePBX (also works with Elastix) that reformats all the CDR data into truly useful reports, such as by person, time of date, inbound, outbound, etc in more summary fashion than individual call-by-call (although that is still possible). Overall it is more useful than the built-in CDR Reports tool. The final add-on we will cover is another CDR statistic program, CDR Stats by Areski. 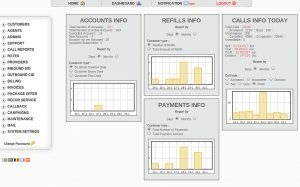 This is a not a plug-in for a GUI, but an entirely separate web GUI. 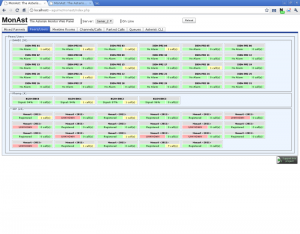 It has the ability to work not only with Asterisk, but with Freeswitch as well. 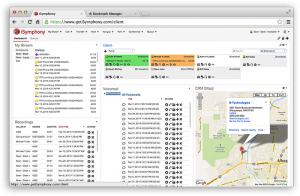 It covers not just pure call record reports and statistics, but can also monitor call traffic and send alerts for unusual patterns as well. It can also “rate” calls (i.e. give a total billed cost for each call by entering the price plan you pay for minutes. Overall it is possibly one of the best CDR stats programs available.